We know that they are usually mentioned with church leadership. For example, 1 Timothy 3:1-7 gives qualifications of overseers and then beginning in verse 8 we read, “In the same way, deacons are to be …” In addressing the Philippians church, the Apostle Paul wrote, “To all God’s holy people in Christ Jesus at Philippi, together with the overseers and deacons” (Phil. 1:1). We also know that they must be held to a high standard. See 1 Timothy 3:8-13 for a list of qualifications. Also, we know that both men and women appear to have served in this capacity in the early church – so there were deacons and deaconesses. Phoebe is an example given of a deaconess (Rom. 16:1). We do not find much teaching in the Bible about what a deacon does. 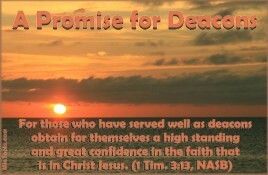 The primary passage pertaining to deacons, 1 Timothy 3:8-13, deals with the character and life of someone who qualifies to be a deacon or deaconess. Their duties are not provided in this passage or other verses. We can, however, look at the original Greek word for help. “Diakonos” is probably from the verb “dioko” which, according to Vine’s Dictionary, means “to hasten after, pursue” primarily denoting a servant or an attendant who waits on others. Accordingly, a deacon would then be someone who cares for the needs of others. Acts 6 is often used as an example of the work of deacons. Be careful to note, however, that the seven men chosen for this responsibility were not actually called deacons in that passage. Yet, we do find the verb form of diakonos in verse two which says, “It would not be right for us to neglect the ministry of the word of God in order to wait on (diakoneo) tables.” The early church leaders, the Twelve Apostles, could not do everything. When complaints surfaced that the “widows were being overlooked in the daily distribution of food” they knew something had to be done. They said, “choose seven men from among you who are known to be full of the Spirit and wisdom. We will turn this responsibility over to them” (v. 3). 1) Their responsibility was to care for the needs of others … specifically here, widows. 2) Those chosen for this task had to meet certain qualifications … known to be full of the Spirit and wisdom. 3) They fulfilled ministry that freed up the leaders to do what they should be doing … the ministry of the Word of God. Caring for the widows would be just one example of how deacons might tend to the practical needs in the church, hence freeing up the elders to preach the Word and shepherd the Body. Undoubtedly there would be many other practical needs for them to meet besides benevolence. And, the Bible does not tell us what spiritual gifts a deacon or deaconess should have to fulfill their responsibility. In light of what we have concluded about their responsibility, we can surmise which gifts would be good for them to have. That, however, is a topic for the next post. This entry was posted in Miscellaneous Ministries . If overseers (Bishop/Elders) and Deacons share the same qualifications aren’t they all males? Where in scripture is there reference to females in the church authoritative positions? Hello, Winston. The qualifications listed in 1 Timothy 3 are ones we can actually find elsewhere that apply to all Christians … not just what leaders should exemplify. As followers of Jesus, we all should be above reproach, etc. The list of qualifications is brought together here because overseers/elders/deacons are to set an example for the rest of the Body, not because they are exceptional to other believers. While the qualifications are similar for both overseer/elders and deacons, except that elders are also to be able to teach, their roles in the Body seem to be distinct. Overseers/elders appear to look after and provide oversight for more of the spiritual affairs of the Church while deacons appear to care for more of the temporal needs. Even the Greek words used for these roles is distinct, with the word for deacons being that of a servant. To be sure, different church groups give deacons a different role than what is described in this post. Some would give deacons a more authoritative role. But, the purpose herein in not to present denominational practices but rather to state what the Bible does or does not say. If you go with a role for deacons similar to what is presented in this post, a deaconess would not be in a top authoritative position. As to the possibility of a female being a deacon (deaconess), as noted in the post, Phoebe is called a “diakonos” which is the same word used for deacon in 1 Timothy 3. If you use the argument that she is just being called a servant, albeit one whom Paul commends in her role, then you can also just call those in 1 Timothy 3 servants as well. Also, in 1 Timothy 3:11 it reads “In the same way, the women are to be …” Some interpret it to be qualifications for deacons’ wives while others think it refers to deaconesses. The word used for “women” is literally women and is elsewhere sometimes translated as wives. So, I don’t believe we can take a dogmatic stand either way to use verse 11 as an argument for or against deaconesses. Further discussion could find us going round and round on this which is not the intent of this post. My task is not to convince people to a certain position but rather to present what Scripture does and doesn’t say. Hello, Denise. We do not have more published than what you can read in these posts so I will give you a few thoughts here. In the Bible the role of deacons seems to primarily be that of serving the needs of the church in practical ways. You can see this in the example in Acts 6:1-6 where seven were selected to take care of the practical needs of the widows so the apostles could give their “attention to prayer and the ministry of the word.” Similarly, elders seem to be the ones responsible for teaching and leading the congregation while deacons have more of a support role, primarily in caring for physical needs. How this works out for deacons/deaconesses today could vary based on the needs of the congregation. Perhaps that is why, as mentioned in this post, the Bible doesn’t give a list of tasks for them. Much of the work, however, would tend to be of a benevolence nature (helping with financial needs, caring for widows, taking meals to shut-ins, etc.) and hospitality (related to visitors and newcomers to the church). I hope this helps. Not able to find the informatiion i need. Will you please send me nrww book on the subject? Hello, Sarah. I am sorry but we do not have any book on this subject. Let me suggest that you check out the resources listed under the ‘Deacon’ tab on the Resources for Nuts & Bolts Ministries page. You may be able to find the information you need in those resources. I wish to let you know that I found your post very useful; it has further widen my knowledge about Deacons and the roles they play in the church. Thank you! I praise God this post has been helpful to you. May He will be glorified in and through you as you serve Him.